Singapore Swimming Proficiency Award (SSPA) is a new initiative by Singapore Swimming Association which launched in 2013, an award structured to promote swimming proficiency as the platform for swimmers to enjoy all aquatic sports. A total of 20 certificates and badges can be attained if the swimmer completes all the level. Nonetheless, the swimmer may wish to challenge himself or herself by attempting any particular level of swim test. 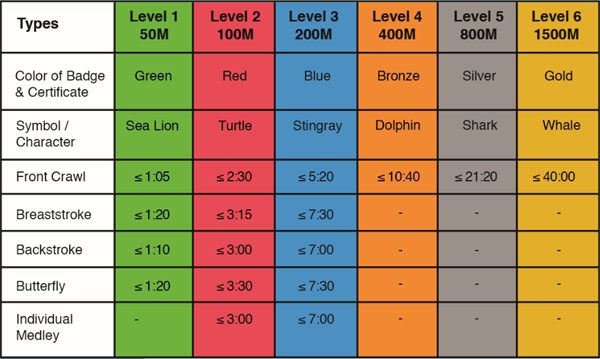 In completion of level 1, 2 or 3, the swimmer has an option to purchase a rainbow certificate and badge.